UtopYA 2015 starts 4 days… 4 days folks! And that meas it’s time to get ready for real–no more lists in our heads of what we want to bring, who we want to see, and what we want to do–we’ve got to pull out the suitcases, pack ’em up, and make sure we have everything we need. It can be a daunting and scary process leading up to the con, from packing, to traveling and getting to the hotel, to meet and greets, and toting your books around and getting to the right places, but I’ve got some tips and advice for you. Get your last minute tickets here, if you still need one!!! So, you’ve purchased your ticket to the con, but still need to pack, right? Pack light. You’re only at the conference for four days, and you don’t need to change your outfit multiple times a day. TRUST ME. You may feel like you’ll need extra clothes just in case, but you truly don’t. PACK LIGHT. The more room in your suitcase when you arrive, the better off you’ll be when you leave with ALL YOUR BOOKS!! Plus, I hardly packed anything to wear last year, and I still didn’t wear it all. 1 “formal” outfit for the awards ceremony with shoes and accessories to match (think PROM) and 1 costume for karaoke. 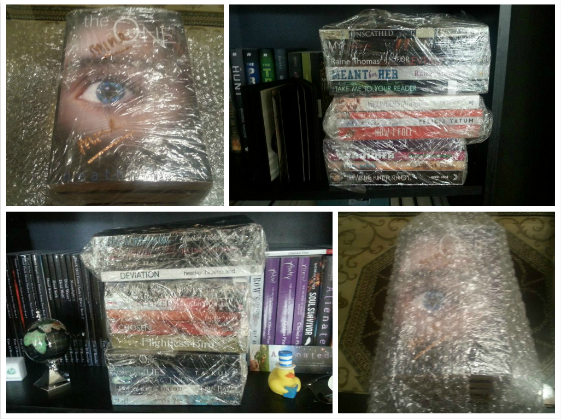 Saran Wrap and Bubble wrap (you will want to double wrap your books in stacks for the travel home so they don’t flop all over the suitcase and end up damaged) ====> Newspaper is NOT a good idea, though, as it leaves black ink on things and is too thin. Cash for books—some authors take credit cards via PayPal, but it’s just easier with cash on hand. There are ATMs in the hotel, though, if you run out. Name Badge that shows off your icon. People don’t know my face or necessarily my full name, but they DO know my blog, so last year I made my own badge to stick over the white badge UtopYA gives out, and it worked like a charm. Bring business cards to hand out as well, if you have them. If you can drive to Nashville without getting car sick (like I do), then do it! But, if you’re like me, or if it’s just too far by car, then fly. If you’re taking SOUTHWEST, then you’re already ahead of the game–Southwest is the only carrier I’ve found that doesn’t charge for luggage. This is a book conference, so that means you’ll have LOTS of books to take home. You could mail them, technically, and spend a lot of dollars doing it, OR, you could fly Southwest, which allows you TWO FREE CHECKED BAGS UP TO 50 POUNDS EACH! Yeah. <== This. I flew Southwest last year based on their stellar service and the free checked luggage. Remember, you don’t need a suitcase filled with clothes. But you DO need lots of space for your books. I checked two bags for the conference last year, and one was completely empty on my way down to Nashville. Hey, it’s free, right? And it saved me a ton of cash when I left the conference because I checked all my books… my combined weight with books, swag, and clothes was about 76 pounds between the two bags (not counting my 30 pound carryon). And about 50 pounds of that 76 was book weight. Imagine the price tag on mailing home 50 pounds of books? BUT–maybe you’re not flying Southwest and there’s a fee to check your bags… find out how much that fee is for a certain weight… sometimes it’s just $25 extra for 50 pounds… still cheaper and faster than mailing them. Check around and see your option. ALSO–make sure you bring a carry-on, and that it has wheels. Put as many books as you can IN IT for the trip down to Nashville, because if you’re packing light for the con, and your checked luggage is sparse, as it should be, you want to keep your precious books safe from flopping around as the luggage gets thrown around. Plus, you will want it for the conference to transport all your books and swag (and, it’s gentler on your body). 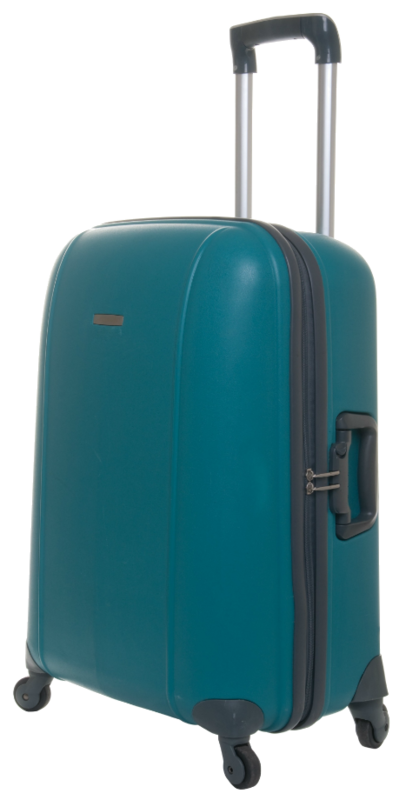 I wheeled my carryon all over the conference this year, and it was a real life saver. Even though my room was just upstairs, and totes are everywhere and they’re fun to use, carrying books around is heavy, and it hurts your back. So bring a rolling carryon. Trust me. And if you have the chance, do what I do when flying home: if they’re asking people to standby and take another flight because your flight is full, DO IT–if they’re offering vouchers! In 2013, Southwest asked me to take the next flight out, which was just four hours later than my original, and they GAVE ME A VOUCHER FOR DOUBLE WHAT I PAID FOR MY ROUNDTRIP TICKETS. That means my flight for the 2014 convention to Nashville was completely free! In other words, make sure you don’t schedule any pressing engagements for June 22, 2015, and take the voucher on any flight if they’re offering, and it’ll add up to some awesome free flights. I took my voucher from 2013 and paid for BOTH my trip to Nashville AND my vacation to Florida. For real. Take the voucher if the opportunity arises. So you’ve arrived at the airport and you don’t have any friends coming to pick you up and take you to the Millennium Maxwell House Hotel. NO WORRIES. The hotel does offer a FREE shuttle service roundtrip to the airport, even if the concierge tells you they don’t… however, for the sake of time, you may want to go ahead and just book a shuttle service instead, which is what I did my first year attending in 2013. While FREE is nice, I did spend over an hour waiting for the Millennium Maxwell House Hotel Shuttle to pick me up from the airport (only seats 10), and I spent a good 45 minutes waiting for it to take me back to the airport at the end of the conference. So plan accordingly and make sure you head out for the shuttle early, especially if you are under any time constraints. May I suggest InShuttle… a very prompt service that will take you roundtrip between the Maxwell House and the Airport for ONLY $18 (it will also take you other places, but the fee is a little higher). I used this service in 2013 and really enjoyed it. Once you get to the hotel, check in… to both the hotel and UtopYAcon 2015 (if that’s an option at your arrival time). You want to get registered as soon as possible… trust me. If your room isn’t ready and you have to wait in the lobby, ask the concierge to hold your bags for you (they will), and go grab a bite to eat in the Bar. Internet — Wired internet is available in the hotel rooms for a fee of $9.95 per day, but it is free of charge in the lobby. Our internet didn’t work in the rooms at all this past weekend, so it was taken off the bill for all guests. Parking — Free! Free public parking is available on site (reservation is not needed). Upon checkout, the hotel does automatically add on a $50 a day amenities charge JUST IN CASE, so if you see a pending transaction for a lot more than your bill AFTER you check out of the hotel next year, rest assured that it will be taken off—it’s only a security measure. But do make sure you FOLLOW UP with the hotel about it! Bring it. Not a ton, but definitely have snacks. The hotel restaurant and bar is indeed delicious, but they’re both tiny, and when 700+ people are all hungry for lunch, it just doesn’t work. If you want to eat in either of these places, plan to eat during off times. 11am brunch, or 2pm lunch… avoid the crowds so you don’t have a long wait and can get back to conferencing. Go in knowing that this conference is epic. I adore it and the laid-back nature of it all. Janet Wallace, the founder of UtopYA, has made it an unforgettable event that you just cannot miss! This year’s keynote speakers are Denise Grover Swanke, Lauren Miller, Kim Holden, and Lauren Miller. From Thursday-Saturday, each will speak, beginning at 9am. But don’t wait until 9am to get your seat!! There are always amazing giveaways to start the mornings, so make sure you’re in the conference room by 8:30 at the latest!! So many people showed up late, missing the opening statements and, therefore, lost out on their prizes! Hey, more for me! But seriously, you don’t want to be late for the opening announcements each morning. We also have a full day author signing event on Saturday from 11-4! It’s FREE to the public, but you STILL NEED A TICKET–get it now, time is running out! ference as many authors only bring limited quantities. Though, there is a bookstore on site, it also seemed a bit limited itself last year. BUT–Pre-order’s are available for a TON of authors! Check out this pre-order list hosted by Maria Pease. You can check out what kind of deals/sales the authors are offering, and find some amazing swag. Just click the name of the author to go to their pre-order page, and MAKE SURE you write down what books you purchased on a spreadsheet so you don’t forget, especially if you’re buying a lot! Many authors also have deals for those pre-ordering, like extra swag, lower prices, etc., so do check out the pre-orders list. And, be sure to check out Jo Michael’s Blog Post about giveaways, freebies with pre-orders, and her advice of what to bring/do while at UtopYA. It’s great! 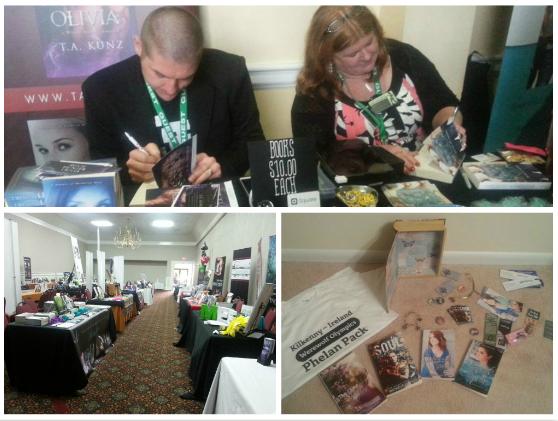 Likewise, you will acquire much swag and meet tons of authors you haven’t read yet. So bring cash in case you decide you want to buy their books as well—I met so many new authors and after connecting with them and learning about their books, I just had to have them! Set a budget and plan accordingly. If you didn’t drive, or you just can’t check anymore bags for whatever reason… so you need to mail them home. That’s cool, just make sure you send it USPS (regular mail) and tell them it’s MEDIA MAIL (if you’re mailing in the USA ONLY–media mail doesn’t exist for international mailing)! I highly suggest avoiding FedEx because it’s mad expensive. USPS is the least expensive, and media mail makes it even less so. But you can ONLY send books media mail—not swag, so I suggest putting on the swag in your checked luggage as it’s light (and make sure you put any and all magnets in your checked bag—I made the mistake of putting my business card magnets in my carryon and the TSA agents flagged it and were seriously nervous about going through my bag). 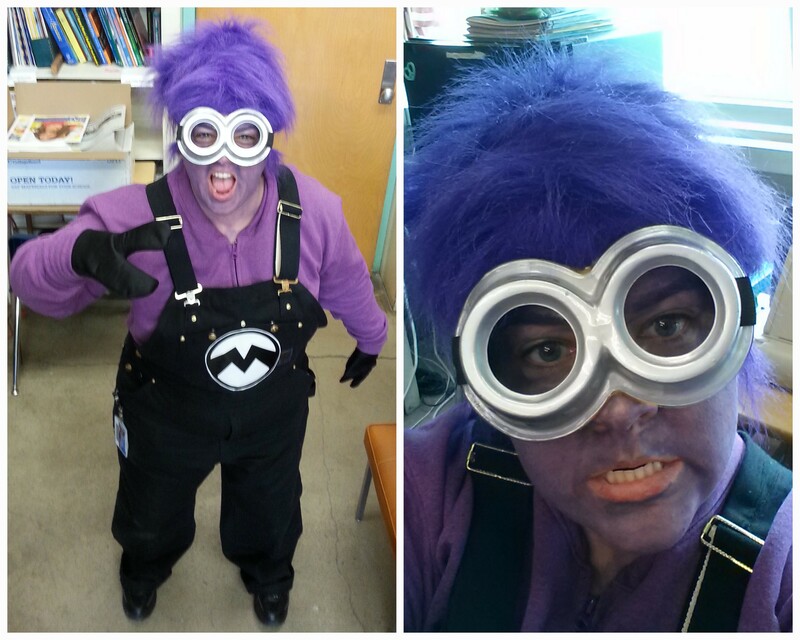 And did I mention costumed karaoke? Because, yeah. That happened, too. BRING AN OUTFIT–you don’t have to sing!! This year I am saddened to say that I will NOT be in attendance… school is STILL in session and my students are taking their finals through June 19… and since I’m not allowed to take off during finals, it just didn’t work out this year. Had I been able to come, THIS would have been my karaoke outfit. You’re welcome. The awards are a BIG DEAL at UtopYA. It’s like a red carpet event; it’s not a sit down dinner event, but there is a cocktail hour prior to the awards, and the hor d’oeuvres are delectable, though you still might want to eat a light meal prior to the awards ceremony. What to wear? Well, really it doesn’t matter. Since it’s like a red carpet event, most people were dressed to varying formal degrees—from sundresses to prom dresses, I saw them all. I also saw slacks and jeans, so don’t feel like you have to dress up! It’s not mandatory. The only thing that is mandatory is that you have a good time, and that’s a given. And make sure you stick around for the after-hour dance party, which is great fun! And over the course of the year I’ve posted a TON of information about UtopYA–check them all out below. All in all, UtopYA is beyond fantastic! What do I love about it? Everything! But especially that authors and aspiring authors, publicists and publishers, bloggers and readers, cover designers and cover models are all in close proximity to one another, chatting, networking, eating, singing, dancing… and the list goes on. It’s like one HUGE slumber party for four days, and mixed in are awesome activities, with keynotes, panels, visiting booths, signings, pool parties, an awards ceremony, dancing, costumed karaoke, and even some sight-seeing, should one so choose–I hear there’s even going to be a tattoo party… yeasssss! I love that it’s a camaraderie of talents where attendees are willing to share their experiences, jump out of their comfort zones, do some crazy fun things, and all the while make long lasting friendships. You’re going to have a blast. Just. Breath. UtopYA 2014 has just ended, and I seriously have an UtopYA hangover. This is the second year I’ve attended the con, and let me tell you, it is beyond fantastic. What do I love about UtopYA? Authors and aspiring authors, publicists and publishers, bloggers and readers, cover designers and cover models are all in close proximity to one another, chatting, networking, eating, singing, dancing… and the list goes on. It’s like one HUGE slumber party for three days (soon to be four), and mixed in are awesome activities, with keynotes, panels, visiting booths, signings, pool parties, an awards ceremony, dancing, costumed karaoke, and even some sight-seeing, should one so choose. I love that it’s a camaraderie of talents where attendees are willing to share their experiences, jump out of their comfort zones, do some crazy fun things, and all the while make long lasting friendships. This year we changed venues, staying at the Millennium Maxwell House Hotel in Nashville instead of the Scarrit Bennet Center, and while there were a few kinks here and there, as there always are with any first time change of venue, the conference overall was a great success; being all in one place instead of having to travel back and forth between hotels and the conference allowed me more time to connect and network with those around me. And as the conference was more than double in size this year, I needed that extra time to make sure I was able to connect with everyone I wanted to connect with. I have to admit that I didn’t go to any panels this year. With over 700 attendees, nearly 60 booths, and over 100 authors to meet, I spent my time visiting the booths and connecting with my friends—many of whom I’ve met online in the We Are Going To UtopYA Facebook Group, and it was absolutely wonderful to not only reconnect with old friends from last year’s conference, but also meet new friends in person. While there were a ton of panels, and I really did plan to go to them, meeting and greeting authors and fellow bloggers won out for me this year, especially as I’m not an author or aspiring author, which is what this year’s panels were more geared towards, so many of the logistics of the panels themselves didn’t pertain to me as much. And that’s okay, because I had so many people I wanted to meet and network with that it literally took me two full days to hit every one. But I do hope that perhaps next year there will be a blogger track on top of the author track, and maybe even a reader track, since three panels run simultaneously, which would allow for some specifics for bloggers, etc., but we’ll just have to wait and see what’s in the stars for panels next year. The lovely part about UtopYA is that is really is about connections, and we—authors, bloggers, editors, panelists, personal assistants, readers, cover designers, cover model, and fans—ate lunches and dinners together, dressed up and sang karaoke together, danced the night away after the awards together, took hundreds of pictures together, put twitter handles and Facebook pages with faces, and all around connected in a very real way. It was awesome. And the highlight of it all? 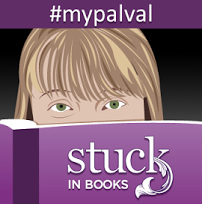 Meeting Valerie from Stuck In Books. Up until Thursday, I had never really spoken to Val. I stalked her blog, but we didn’t really know each other. 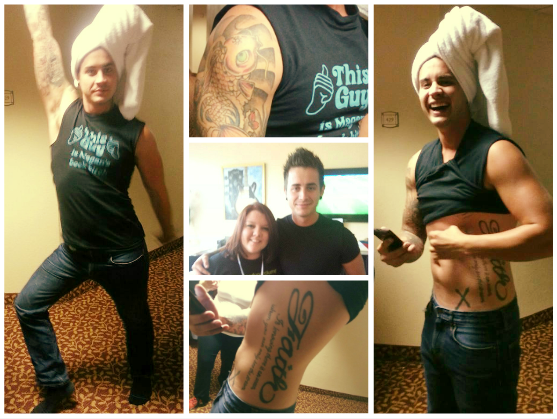 Thankfully, Tiffany King knew we’d be the best of friends, and told us to room together. And I’m so glad we did. I don’t think I’ve laughed so hard in all my life—tears and snorts were a constant as we giggled, belly laughed, snarked, and constantly fought with the door from hell and the evil bathroom light. Another reason you should go? A half-dressed cover model might just randomly knock on your door just to see your reaction. Yeah, that happened. There’s a video of it somewhere, but I’m not posting it because seriously, I sound completely and utterly ridiculous. Best. Moment. Ever. As you can see, UtopYA 2014 was just amazing, and I cannot, cannot, cannot wait for June 2015, which I believe is actually going to be even bigger still, and even more epic as founder Janet Wallace and her amazing assistants roll out some changes, such as making it a FOUR day conference with an all-day fan signing built in… and it just can’t come fast enough! 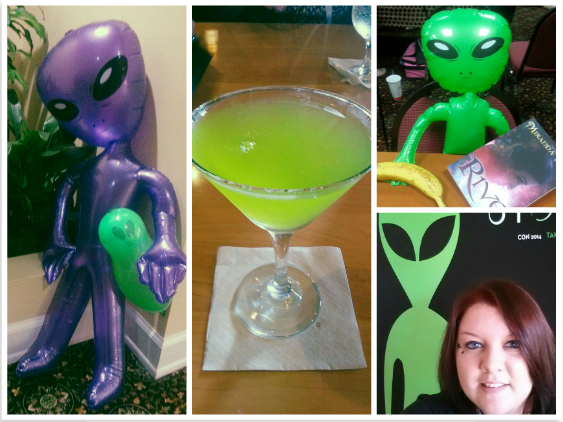 So, if 2014’s theme was Aliens and #Take Me To Your Reader, what’s 2015’s theme, you might ask? TIME TRAVEL! The tagline is, “Write Your Own Future,” and I already have the perfect outfit for the awards ceremony… score! Now, you might have just read all that and thought to yourself, “that sounds great, but I have no one to go with,” or “I’d love to go, but it’s probably too expensive.” So, I just want to break that mentality right this minute, because I’ve been there twice now, and this event pulls you out of your shell and makes you the center of attention, and you will be so very glad you came. 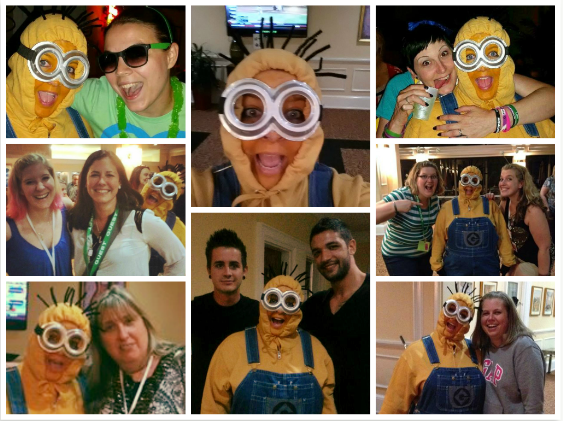 I highly, highly suggest you purchase the VIP package, which is what I purchased for June 2015. Having experienced the hotel and now having inside knowledge of the layout, the VIP package is the best deal—you get lunches Thursday and Friday, so you don’t have to fight to get a table at the little restaurant, and a t-shirt is included—which you’re going to want because they’re epic AND you can have all the authors and attendees sign them—EPIC, I say! But act fast, because there are only a limited number of these earlybird tickets, and prices are only good for the next two weeks, or until sold out, whichever happens first. Right now, tickets are the cheapest they’ll ever be for the 2015 con; prices will continue to rise! Refunds are available until April 30, 2015, so act now—I know it’s a year out, and your circumstances may change, but I highly, highly suggest that you book now. **prices subject to change—I will post updated prices throughout the year. We’ll be at The Millennium Maxwell House Hotel again in 2015. If you click the link to your left, you’ll be taken directly to the Millennium Maxwell House reservations for UtopYA 2015 and you won’t need to enter the code… the group rate is just $105 per night. If you don’t use the direct link provided, make sure you use this code to get the UtopYA rates: 1506UTOPYA. Again, the dates for UtopYA 2015 are June 18-21, so you’re looking at about four nights if you come in June 17 and plan to check out on the 21st. AND, here’s the best part: all you need is a credit/debit card to HOLD your room! No money comes out of your account until you check out (and you can cancel your reservation up to TWO days before the conference with no penalties). These rooms go fast, so don’t wait! You can always cancel later if the problem arises. 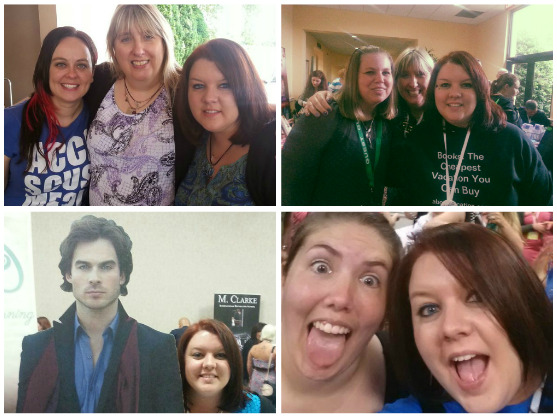 For UtopYA 2014, I roomed with the amazing Valerie from Stuck In Books, and it was epic. She’s an astounding blogger, and we got on famously. I was ecstatic to room with her, and next door to us? Authors Megan Curd, Adrianne Boyd, and Mindy Ruiz! And the next few rooms? Authors Heather Self, Megan Vernon, and cover model Joshua Sean McCann, and the list goes on and on. EPIC. In other words, you won’t be alone in the hotel, and if you need a roommate to help cut costs, you can easily find one! The more the merrier in a room! I’m actually a really quiet, shy person who is socially awkward and doesn’t speak in situations where I don’t feel comfortable (though I bet Val would disagree). Are you like me? Then you’ll thrive at UtopYA. I didn’t have trouble speaking to anyone at all, I loved my roomie, and I hung out with the rest of the people on my floor… all around amazing time. Yeah, so don’t let the hotel situation stop you from coming. Need a roomie? Join the We are Going to UtopYA Facebook Page and easily find one! Think about it: if you split $105 by two, it’s just $52.50 a night for four nights, a total of $210 plus tax to stay at the hotel where the convention is held! That’s a GREAT PRICE! OR, find three other roommates (total of four in a room) for a price of $26.25 per night… a total of just $105 plus tax for four nights to stay at the hotel where the convention is held! That’s a GREAT PRICE, TOO! Don’t worry, you won’t be spending much time in your hotel room, anyway, so multiple people in a room, though it may sound scary, really isn’t bad at all. Trust me. In other words, PLEASE don’t let the price of the hotel or the need of roommates, etc., STOP you from coming! Also, word to the wise, upon checkout, the hotel does automatically add on a $50 a day amenities charge JUST IN CASE, so if you see a pending transaction for a lot more than your bill AFTER you check out of the hotel next year, rest assured that it will be taken off—it’s only a security measure. The Millennium Maxwell House Hotel does offer a FREE shuttle service roundtrip to the airport, even if the concierge tells you they don’t… however, for the sake of time, you may want to go ahead and just book a shuttle service, which is what I did my first year attending in 2013. While FREE is nice, I did spend over an hour waiting for the Millennium Maxwell House Hotel Shuttle to pick me up from the airport (only seats 10), and I spent a good 45 minutes waiting for it to take me to the airport at the end of the conference. So plan accordingly and make sure you head out for the shuttle early, especially if you are under any time constraints. May I suggest InShuttle… a very prompt service that will take you roundtrip between the Maxwell House and the Airport for ONLY $18 (it will also take you other places, but the fee is a little higher). I used this service in 2013 and really enjoyed it, and I plan to use it again in 2015 to avoid long wait lines for the free shuttle. Southwest is the only carrier I’ve found that doesn’t charge for luggage. This is a book conference, so that means you’ll have LOTS of books to take home. You could mail them, technically, and spend a lot of dollars doing it, OR, you could fly Southwest, which allows you TWO FREE CHECKED BAGS UP TO 50 POUNDS EACH! Yeah. <== This. I flew Southwest again this year based on their stellar service and the free checked luggage. Honestly, you don’t need to bring much in terms of clothes and such (which I’ll talk about next). But you DO need lots of space for your books. I checked two bags for the conference, and one was completely empty on my way down to Nashville. Hey, it’s free, right? And it saved me a ton of cash when I left the conference because I checked all my books… my combined weight with books, swag, and clothes was about 76 pounds between the two bags (not counting my 30 pound carryon). And about 50 pounds of that 76 was book weight. Imagine the price tag on mailing home 50 pounds of books? Yeah. Don’t. Take Southwest. Oh, and make sure your carry-on has wheels. You might want it for the conference to transport all your books and swag (plus, it’s gentler on your body). 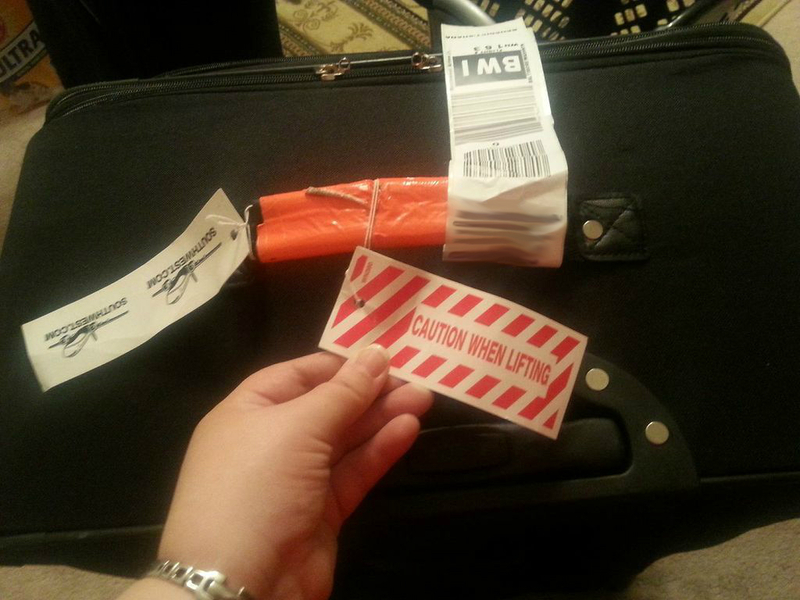 I wheeled my carryon all over the conference this year, and it was a real life saver. Even though my room was just upstairs, carrying books around is heavy, and it hurts your back. So bring a rolling carryon. ALSO, if you have the chance, do what I did last year: On your flight home, if they’re asking people to standby and take another flight because your flight is full, DO IT! In 2013, Southwest asked me to take the next flight out, which was just four hours later than my original, and they GAVE ME A VOUCHER FOR DOUBLE WHAT I PAID FOR MY ROUNDTRIP TICKETS. That means my flight for the 2014 convention to Nashville was comp’d; completely free! In other words, make sure you don’t schedule any pressing engagements for June 22, 2015, and take the voucher on any Southwest flight if they’re offering (free bags, remember), and it’ll add up to some awesome free flights. I took my voucher from 2013 and paid for BOTH my trip to Nashville AND my vacation to Florida. For real. Take the voucher if the opportunity arises. If you DO decide to mail books, make sure you send it USPS (regular mail) and tell them it’s MEDIA MAIL (if you’re mailing in the USA–media mail doesn’t exist for international mailing)! I highly suggest avoiding FedEx because it’s mad expensive. USPS is the least expensive, and media mail makes it even less so. But you can ONLY send books media mail—not swag, so I suggest putting on the swag in your checked luggage as it’s light (and make sure you put any and all magnets in your checked bag—I made the mistake of putting my business card magnets in my carryon and the TSA agents flagged it and were seriously nervous about going through my bag). Pack light. You’re only at the conference for four days, and you don’t need to change your outfit multiple times a day. I hardly packed anything to wear, and I still didn’t wear it all. I’ve already said it in my opening statements, but this conference is epic. I adore it and the laid-back nature of it all. Janet Wallace, the founder of UtopYA, has made it an unforgettable event that you just cannot miss! There were also amazing giveaways to start the mornings, so make sure you’re at the conference on time! So many people showed up late, missing the opening statements and, therefore, lost out on their prizes! Hey, more for me! But seriously, you don’t want to be late for the opening announcements each morning. I’m also hoping next year there are more prizes for the general populace as opposed to “author only” giveaways, as there are indeed a lot of us in attendance that aren’t authors. We’ll also have a full day author signing event on Saturday from 10-4 in 2015! This is a great addition for which I can’t wait! This past year, we had an author signing from 6-9 on Friday, and it was great, but I think an all-day affair will be even better. This will allow even more time for authors and fans alike to get their books signed, making it easier to pinpoint your particular author’s whereabouts because, as I said earlier, it’s become a rather large conference. And did I mention costumed karaoke? Because, yeah. That happened, too. Guess which one I am? I HIGHLY suggest that you bring as many books as you can TO the conference as many authors only bring limited quantities. Though, there is a bookstore on site, it also seemed a bit limited itself. Pre-order links usually come out from authors as well about two months in advance, and I posted all their links on the blog for the 2014 conference, and will do so again next year when the time comes for the 2015 conference—preorders are great because then you pick them up from the author at the conference. But MAKE SURE you write down what books you purchased on a spreadsheet so you don’t forget, especially if you’re buying a lot! Many authors also had deals for those pre-ordering, like extra swag, lower prices, etc., so do be on the lookout for that closer to the date. For those favorite authors who didn’t have a preorder link, I personally contacted them and asked if they’d have all their books with them, or if I should bring my own for signing, and most recommended I bring my own to guarantee that I have them. Some authors brought copies just for my purchase based on my query too, so they might tell you they’ll reserve some for you, but I definitely recommend double checking prior to the conference. There is nothing worse than planning on buying a book from your favorite author to only find they are sold out. So, plan ahead. Books tend to be about $10-15 on site from authors, FYI, and they tend to be cheaper via the author OR Amazon as opposed to the onsite bookstore (at least, that is how it worked this year). An uplifting, collaborative and educational conference for those who love supernatural and contemporary young adult and new adult fiction! Panels, filled with writers and experts in the publishing and entertainment industries, will have something for established and aspiring authors and screenwriters to improve their craft and advance their careers, as well as FUN panels for fans where then can directly influence and interact with their favorite authors! 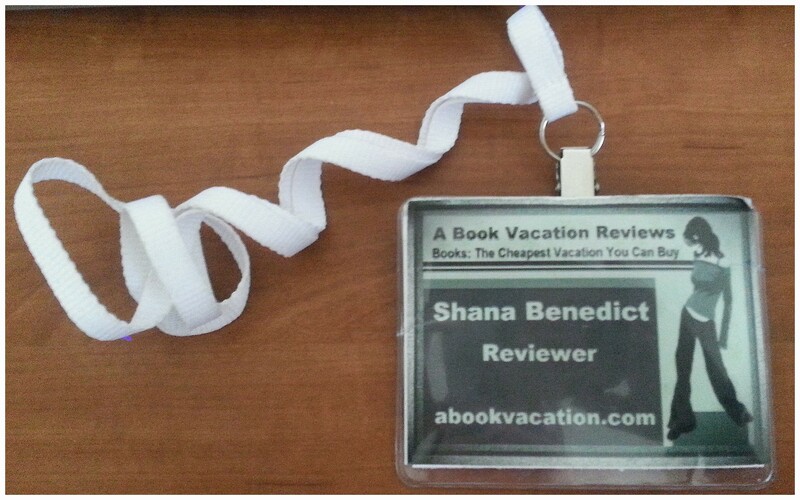 Meet your favorite authors in friendly, level playing field environment. * UtopYA caters to the full gamut of those on any side of the publishing fence because we have a lot to learn from each other, much we can share and even more we can innovate together. And you won’t want to miss the Fourth Annual UtopYA Awards on Saturday night, where we celebrate the writers, producers, editors, bloggers, designers and others who bring our favorite characters and stories to life! With 30+ categories, live music, interactive live streaming and celebrity hosts and guests, it’s YOUR chance to dress up and get down with your favorite authors and friends! UtopYA expands to 4-day conference – Thursday through Sunday. Two full days of panels, exhibitors, meet & greets, parties and the best keynote speakers will be follwed by a full day signing event on Saturday (10 AM – 4 PM). Similar to the massively popular TED talks, UtopYA gives you the chance to apply/submit your “talk.” If chosen, you could share your ideas on publishing, marketing, community-building, craft, trends, good-doing, and forward-thinking with attendees at the 2015 UtopYAcon. and more surprises to come!! Grab your ticket and reserve your room in the official conference hotel, Millennium Maxwell House, now! REFUND POLICY: No transferring or reselling of tickets allowed. Not for use in giveaways, contests, or sweepstakes. Full refund available up to 60 days from purchase (unless April 30, 2015 comes first). After 60 days, refund minus processing fees available until April 30, 2015. No refunds after April 30, 2015. The awards were much bigger this year, and though we had some technical difficulties here and there, it was fun all the same, especially with the cover models strutting their stuff across the runway. 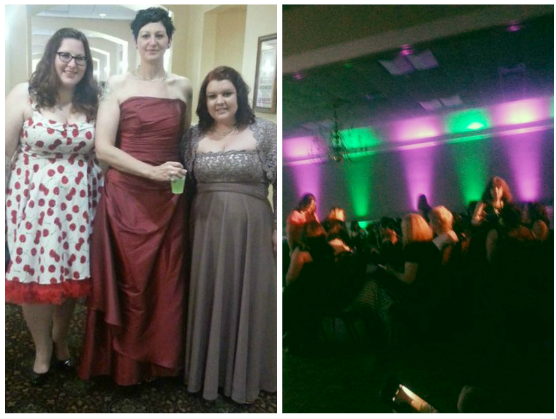 It’s like a red carpet event and it was so awesome to be a part of it, especially as my blog and I were nominated for three awards! As of right now, it’s not a sit down dinner event, but there was a cocktail hour prior to the awards this year, and the hor d’oeuvres were delectable, though you still might want to eat a light meal prior to the awards ceremony. Also, keep your ears open as food may become part of the awards at some point down the line. This past weekend, on top of the cocktail hour was an after-hour dance party as well, which was great fun, and I’m hoping the same happens again in 2015. Again, keep your ears open—updates will be posted as I get them. Questions, comments, concerns? Let me know and I’ll do the best I can to answer them, or put you in touch with someone who can. Also, make sure you check out UtopYA online as they begin updating their site for next year’s event. See you there!! 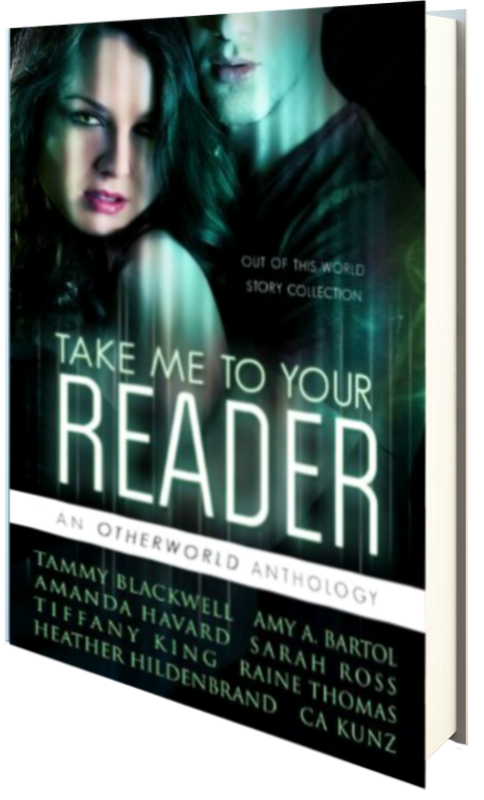 AND–make sure you pick up a copy of the first ever UtopYA anthology from 2014, complete with NEW, original short stories from these authors: Tiffany King, Heather Hildenbrand, Amanda Havard, Amy Bartol, Sarah M. Ross, Tammy Blackwell, Raine Thomas, and C.A. Kunz! I’m hoping there is an anthology for 2015 as well!